The name “Dailuaine” (pronounced ‘dale-YOU-an’) comes from the Scots-Gaelic An dail uaine, which means “green vale”. For a distillery residing in the Speyside region, this is a quite accurate name and an incredibly vague one at the same time. During the brief time I spent in this beautiful part of Scotland, all I remember of the farm and distillery dotted countryside was rivers of various sizes, and lots and lots and lots of “green vales”. Once again, I blame whoever named the place for their rather lackadaisical effort on this one. The least they could’ve done was gotten a little more descriptive; maybe “the green valley with one farm”, or “the green valley with the winding river” or “the green valley where that weird horse died.” Nope, instead it’s just “the green vale”…hell, that could be anywhere. Luckily, we know the exact location of the Dailuaine distillery – west of Dufftown by a few miles, and just a quick stroll up from the Spey. Though the distillery is quite old, being founded in 1852, and therefore filled with all the rich history a distillery founded in 1852 can have, official single malt bottlings are rarely seen from Dailuaine. The vast majority of its prodigious output ends up in Johnnie Walker blends. 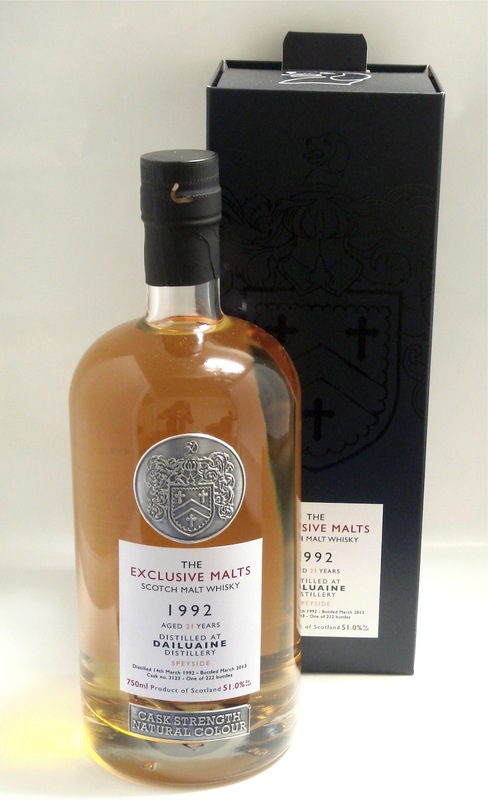 It’s far easier to find independent bottlings such as this one from The Creative Whisky Company’s Exclusive Malts range. The Nose: A surprising nose, but not necessarily in a good way. Initially, there’s a strong lemon-oil, solvent-y heat that overwhelms the subtler notes. Giving it a little more open time, caramel and pale honey emerge, along with softer lemon-curd and juicy Granny Smith apples. There’s a faint grassiness and hints of malted milk balls tucked further back. Not much evidence of 21 years in the barrel, fresh-sawn oak, soft cinnamon, and dried leaves. Adding water does very little to tone down those lemon-solvent tones, instead, it sadly tones down everything else and adds a slight beery tang. The Palate: Ah, there’s the wood…spice tinged-citrus, juicy, navel orange and lemon zest, with a bit of burnt caramel. Slightly bitter, over-steeped black tea and unsweetened cocoa powder. Much more wood spice is quickly evident here, bitter clove, fine-ground black pepper, coarse cinnamon, ginger, and sawn wood. Unlike the nose, adding water does nice things for the palate, smoothing some of the bitterness, lending a bit of needed caramelized sweetness to it all, and drawing out those spice notes. The Finish: Mouthwatering, lingering, spicy, and a little hot. Continued pepper, clove and an appealing herbaceousness. Water takes away the heat and leaves the quite pleasant mouthwatering spice. Thoughts: Hmmm. This one was a little disappointing…mostly because of the nose. That solvent-y quality just rolled over any subtler elements and coupled with the lack of deeper wood notes, gave it a rather youthful feel. The palate is much more expressive and appealing, especially with water, and things did end on a bit of high note with the nice finish. Unfortunately, those first impressions left by the nose were hard to get past. Younger-than-its-years seeming, and a somewhat disjointed, this one did not impress very much.